Capt. 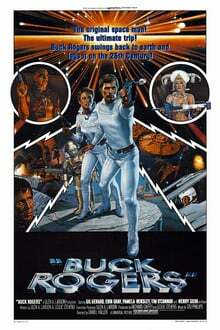 William “Buck” Rogers is a jovial space cowboy who is accidentally time-warped from 1987 to 2491. Earth is engaged in interplanetary war following a global holocaust, and Buck’s piloting skills make him an ideal starfighter recruit for the Earth Defense Directorate, where his closest colleagues are Dr. Huer (Tim O’Connor), squadron leader Col. Wilma Deering (former model Erin Gray, looking oh-so-foxy), the wisecracking robot Twiki (voiced by cartoon legend Mel Blanc), and a portable computer-brain named Dr. Theopolis, who’s carried by Twiki like oversized bling-bling.